NARAINGARH, Haryana, India — The first rain in six months, and a stout and cold wind whipped at the black plastic covering stacks of grain Thursday morning at the Shivshakti Rice Mill, one of 13 mills surrounding this roadside village about 70 kilometers west of Chandigarh. Inside, the mill was quiet, dark, and stocked to the ceiling with more burlap bags heavy with rice, a fortress of stacked grain, like sandbags tiered for a flood. Naraingarh is a place of tiers — levels of social standing and economic well-being formed by the productivity of irrigated clay soils that produce some of the richest crops of wheat and rice in India — and, for that matter, the world. The small roadside village is one of hundreds of farming communities in northwest India that since the green revolution of the 1960s have consistently produced ever larger grain harvests. The joining of high-yield seeds with fertilizer, chemicals, and unlimited amounts of water led to India’s food self-sufficiency. Those same farm practices put Haryana, and neighboring Punjab, at the very top of the per capita income pyramid among India’s 28 states. 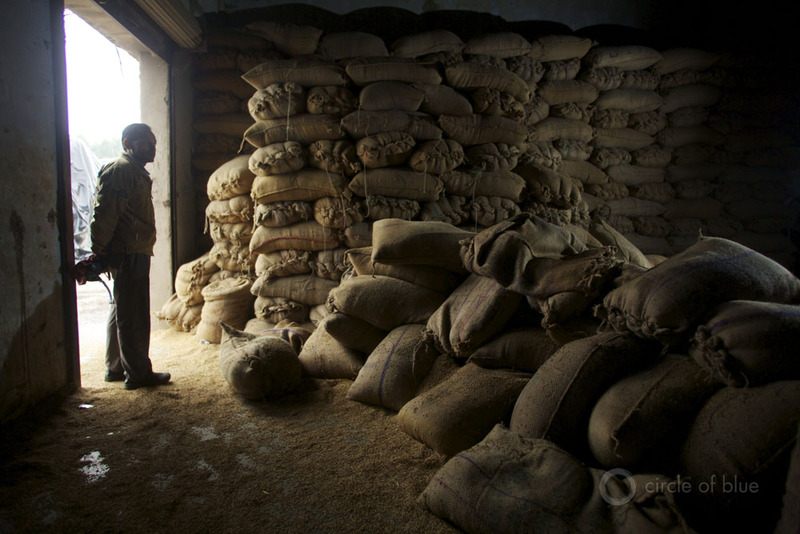 Hard work and ample harvests, of course, reflect the abundant opportunities for those sufficiently entrepreneurial to seize them, like Ashoka Gupta, 50, and his brother Vinod Gupta, 54, who built the Shivshakti Rice Mill into a respected business. The brothers started their careers as teenagers in a grain trading business owned and managed by their father. Both men live in handsome homes in town and send their children to college. The mill, meanwhile, employs 35 people. All of them, a number with wives and children, live in dark and unheated rooms at the mill, putting their backs and hands to work to dry, husk, and bag 2,000 to 2,500 metric tons of rice a year. The jobs pay enough, and are year-round, so they stick around. Still, the building blocks of soil, seed, and water also are yielding a kind of triple threat to India’s farm economy, environment, and food security. For instance, Ashoka Gupta’s 24-year-old son, Varun Gupta, is training to be an orthopedic surgeon. Varun represents the first of the triple threats. As incomes from farm-based enterprises rise and more families can afford to send their children to college, older farmers told us, fewer of the talented young people want to return to agricultural towns and villages to manage their family farm operations. And as incomes and wages rise in urban businesses in Ludhiana, Chandigarh and other cities in this and other regions, workers are migrating off the farm to fill better paying jobs. A labor shortage is developing in the farm sector. The environmental and food security risks also are products of farm plenty. India built its food self-sufficiency, and this region’s farm economy in large part by subsidizing virtually every facet of the natural resource base needed to produce harvests of wheat and rice that now exceed 100 million metric tons annually. Much of the crop comes from these two states alone. Farmers receive free electricity, free water, and subsidized prices for seed, fertilizer, and pesticides. The government also sets a generous base price for wheat and rice, and then buys every grain of both crops at harvest. In effect, India farm policy and $tens of billions of public investment each year has removed much of the risk from an inherently risky business. India, as a result, is the world’s number two rice and wheat producer behind China. But free power, water, fertilizer, and chemicals also encourages abuse of resources. Water pollution from farm runoff is serious. Groundwater, which is used in both states for irrigation, is dropping, in some regions by more than three feet annually. Climate change is disrupting patterns of rainfall and snowmelt, steadily reducing moisture needed to recharge groundwater reservoirs in Punjab and to fill the network of surface irrigation canals that water most of the wheat and rice crops in Haryana. Meanwhile, electric pumps that draw groundwater to the surface, and lift water in the big irrigation canals, add to the meteorological chaos that is drying up the region. Roughly 35 percent of Haryana’s electricity is devoted to moving water to farm fields. The percentage is higher in Punjab, where farmers run nearly 900,000 electric water pumps, and their number grows by 20,000 annually. Both states are spending $billions to build new power plants and increase generating capacity. But the new plants, along with the existing electricity generating stations, are fueled by coal, which pours millions of tons of climate-changing gases into the air each year. Talk about a cycle of risk. Free water and power prompts 1) overuse and dropping water tables that is 2) addressed by installing more electric pumps to 3) provide more water in a region that is 4) drying up because of rising levels of climate changing gases produced by 5) coal-fired power plants producing free electricity that leads to more water pumping. In Yiddish, that’s a giant Oy Vey! Not surprisingly, one of the big security issues in India is how much longer this apparently unsustainable system will hold together. 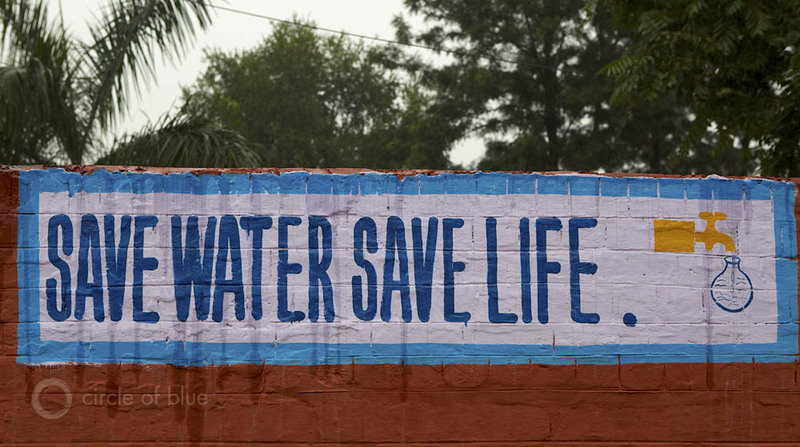 While Circle of Blue was here, India’s Prime Minister Mammohan Singh said in a major speech at Punjab Agricultural University that the state was “overexploiting” its groundwater resources. He called for changes in water use and cropping patterns, particularly in shifting rice production to wetter eastern India. Growing rice here involves keeping seedlings immersed in water, a practice that requires ten times as much water as other grain crops. While everyone we talked to, including farmers, agreed that the laws of supply and demand will eventually prevent farmers from using more water than is available, they also alerted us not to expect drastic changes. This is, after all, a democracy. The subsidized system providing farm inputs for free, and for purchasing farm products, is embedded in state and national politics. India has 700 million of its 1.2 billion people working on farms or involved in the farm sector. Perhaps 100 million are involved in growing wheat and rice. Not too many grain farmers are eager to give up a generous and fixed price for their harvest at the market, or turn back vital resources provided free, or next to free of charge.